From the white umbrellas lining its turquoise pool to the dramatic oceanfront entranceway, Le Vimarn is one of Ko Samet’s most luxurious resorts. Ad Book now! Rates from US$213++. Average rating 8.4 from 810 reviews. The second priciest of the Samed Resorts group’s eight properties, after top-end Paradee, the swish spot sets the tone for Ao Phrao’s upscale atmosphere. Topped with thatch or wood shingles, the white villas feature vaulted woven bamboo ceilings, silk trim, rosewood (or mahogany?) floorboards, four-poster beds with curtains and great views from a hillside with plenty of fountains, frangipani and tropical palms. All expected amenities are included, right down to fuzzy bathrobes and slippers. While the rooms appear to be stacked close together, a smart design allows for adequate privacy on decks that are large enough to lie out on. All of the freestanding villas should do the trick for well-heeled travellers, but honeymooners might go for a top-end duplex with private outdoor Jacuzzi. The emphasis here is on pampering, with polite staff, private boats, plush rooms, fine dining and a range of spa treatments available. Two in-house restaurants offer Thai and Italian cuisine. A large horizon pool is ideally placed beside and above the beach. As with all properties run by Samed Resorts, breakfast and transfer to/from Ban Phe are included in the rates. The only potential disadvantage is Le Vimarn’s location on the south side of the bay, which means that all guests and staff from the other two resorts can be seen walking past along the narrow lane that cuts between the resort and the beach. If that bothers you, Ao Prao Resort, which is run by the same group, has the most private location on the bay and offers slightly less fancy rooms for slightly less cash. If Le Vimarn just isn’t luxurious enough for you, opt for the top-end Paradee Resort on Ao Kiu Na Nok. Le Vimarn has two websites: the newer one, which is an offshoot of the main Samed Resorts site and is included in this listing, offered the more reasonable rates listed here when we checked. Expect to pay considerably more if you book through the older site, www.levimarncottage.com. We also noticed that the cheapest rates of all were available at Booking.com. Last updated on 22nd July, 2017. Check rates at Le Vimarn Cottages & Spa on Booking.com. Up to 9,825/11,000 baht for “premier deluxe”. Room: Deluxe double room, low season: 8,325 baht, high season 9,500 baht. Notes: Up to 9,825/11,000 baht for “premier deluxe”. 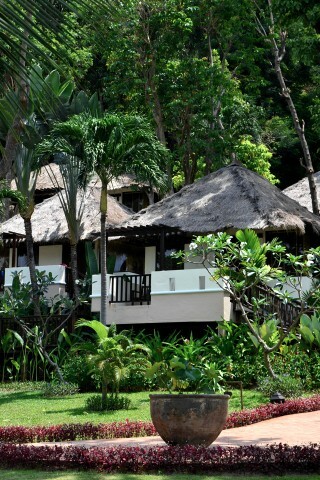 Room: Suite, low season: 14,770 baht, high season 17,000 baht. Notes: Jacuzzi.